Putting human boots back on the moon is part of NASA’s ambitious long-term goals for the next decade, which also includes landing the first humans on Mars and an asteroid. To fulfill its vision, the space agency wants to rely on private space enterprises to meet its hardware needs, and Lockheed Martin is taking this role very seriously. On Thursday, at the World Astronautical Congress in Bremen, Germany, the aerospace company unveiled the design for a spacecraft that’s meant to shuttle up to four astronauts between an orbiting space station and the moon’s surface. Lockheed Martin’s concept for a lunar lander capable of carrying up to four people to the moon’s surface. Credit: Lockheed Martin. Among the plan’s strategic objectives, NASA calls for returning U.S. astronauts on the surface of the moon. Key to accomplishing this goal is a lunar orbiting space station called Gateway, which will serve as a refueling station and launch platform for manned lunar exploration missions. Lockheed Martin’s recently announced lander will be the transport vehicle that will ferry astronauts between Gateway and the lunar surface. 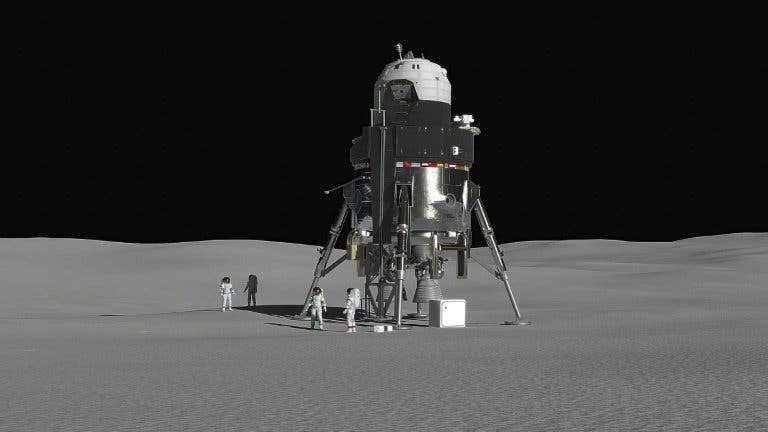 The preliminary design suggests that the lander will be able to carry up to four people and 900 kg (2,000 pounds) of cargo to the moon, with enough life support for a two-week mission. Much of the hardware will be modeled on Lockheed’s future deep-space crew capsule Orion, which the company has been developing for NASA and which reportedly costs $20 billion. The engines run on liquid hydrogen and liquid oxygen, which can both be sourced by splitting water. According to a lunar mineralogical map released by NASA last year, water is present almost everywhere on the moon’s surface, albeit in minute amounts. Important quantities of water can be found on the moon’s polar region, which missions in the future can use to create fuel and oxygen for a manned outpost. Lockheed’s lunar lander will serve as a precursor to an even more ambitious spacecraft: a Mars lander. Similarly to the current moon exploration plan, NASA would like to ultimately deploy a space station to Mars’ orbit. It’s been more than 45 years since the last crew touched boots on the moon, and it might take at least another decade before this happens again. First of all, Gateway needs to be deployed, and for this happen NASA needs to launch the Space Launch System (SLS), the most powerful rocket humans have ever built. Due to delays, SLS won’t fly sooner than 2020 and Gateway won’t be ready earlier than 2024. Given what we know about NASA’s history of pushed deadlines, Lockheed’s planned lunar lander will likely make it to the moon in the late 2020s. Meanwhile, SpaceX announced it would launch the first space tourist on a trip around the moon in 2023. Japanese billionaire Yusaku Maezawa will be accompanied by six to eight artists on the trip.